One day in February 1997, as I idled at my seaside campsite at the Winter Star Party in the Florida Keys, enjoying balmy breezes and sipping cups of chilled nectar served by tropical maidens wearing grass skirts and coconut bras (okay, I made that last part up), up strolled Roland Christen, who asked if Alan French was around (I was camped next to Alan and Sue). I informed him that both Frenches were out wandering around at the moment. Roland said he had something for Alan, and would I please give it to him? I agreed to do so. Roland then handed me a stumpy little black telescope. This was my first encounter with the legendary 90mm Stowaway refractor...or just about anyone's, outside of Astro-Physics itself. I like to refer to this prototype, which Alan still has, as the Ur-Stowaway. Since then, the Stowaway has acquired a reputation as one of the finest, most desirable, and rarest small telescopes in the world. Alan and I used the little guy for the remainder of the star party for very crisp views of seabirds, boats, and whatever else was around. I thought, "Hmm, very nice. I'd like to have one of these," or thoughts to that effect. When I got home I put my name on the waiting list for the scope, then promptly forgot about it, which is the best thing to do when putting one's name on an AP waiting list. For several years after that my choice in small high-quality refractors was the 70mm TeleVue Pronto, a very fine achromat and a lot of fun. However, when using it on the Moon and planets I was always aware of its considerable color error, which came to annoy me more and more over time. By early 2002 I was thinking about replacing it with a more color-free scope that also had a little more aperture. The obvious choice was the TeleVue 85, a very fine telescope in its own right. I probably would have ordered one, but then a bit of fortuitous timing intervened. A very small run of the original f/4.8 Stowaway had already come and gone. Those who were invited to partake of this offering found themselves in possession of an eagerly sought collector's item. Now it was time for a second, and probably final, production run, this time of an f/7 model. According to Roland, this objective lens was the same as that of the exalted Traveler refractor, with the same focal length, but reduced in diameter from 105mm. The rationale for this scope was that customers had requested a longer version of the original Stowaway for general purpose observing, the longer focal length making it easier to reach planetary magnifications with common eyepieces. Yet the scope would weigh just over half as much as the Traveler. Three generations of Stowaways, a sight rarely beheld. From left to right, f/4.8 version owned by Jim Shearer, f/6.6 version (mine, on Sue French's Astro-Physics 400 mount), and the prototype "Ur-Stowaway" owned by Alan French. Astro-Physics called and asked if I wanted one. Having already experienced the lasting pain of turning down such offers from A-P, I promptly said that indeed I did. At $2,880 for the tube assembly, it was the second greatest amount I ever spent on a telescope. Yet what could better answer my desire for a very fine small refractor? With its increased focal length, this scope wouldn't be quite as portable as either the Pronto or the original Stowaway, but given my interest in the planets, I didn't mind the extra length. The scope arrived in its nice black soft case in July of 2002. Engraved on the focuser is the legend "90mm F7". This is the "round numbers" version of the specifications. To be a little more accurate, it's really a 92mm f/6.6, giving a focal length of about 604mm. The objective is an oil-spaced triplet apochromat, multi-coated on the two exposed surfaces with a gentle purplish color. The 92mm O.D. aluminum tube has the nubbly-textured off-white paint typical of recent AP scopes. The tube interior contains a large number of finely machined baffles. The 2" machined focuser, which is completely black anodized, features Feather Touch 2-speed gearing. The focuser and the included 1.25" adapter both use brass compression rings instead of set screws. I believe Astro-Physics was the first telescope company to offer these. The lens cell has no provision for collimation, relying on the precision of the entire tube assembly for maintaining alignment. The dewcap is retractable. The fully collapsed telescope is 20 inches long. Despite the impeccable quality of this tube assembly, in some ways it's not as convenient or as well thought out as the TeleVue scopes. For attaching the scope to a mount, it came with a pair of lightweight simple rings and a small Astro-Physics dovetail bar. This bar can be configured to mate to a TeleVue Gibraltar, Telepod or similar altazimuth head. This is a usable arrangement, but makes no provision for sliding the tube back and forth for balance without fiddling with at least two of the cap screws holding the rings together. The AP dovetail bar is narrower than the common Vixen standard, meaning it can't be used securely in these Japanese mounts or their Chinese clones. Of course the bar would fit perfectly in an Astro-Physics mount. I now rarely use the A-P bar, preferring a Vixen standard bar which allows for instant use with most of my mounts. Another thing the Stowaway lacks is provision for mounting a finder. 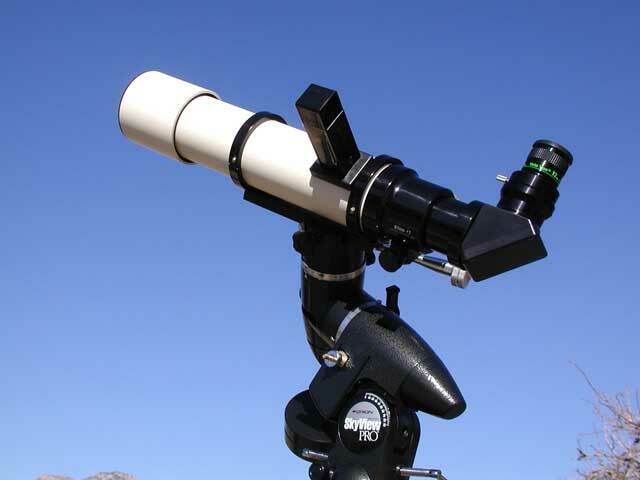 Some say a small, wide-field telescope can act as its own finder by using a low power eyepiece. To this I respond: nope. If I'm observing at 100X or more and happen to lose my object, I absolutely do not want to swap eyepieces, find it again, and then swap back, very likely losing the target again in the process. This is a needless inconvenience caused by the lack of even the simplest finder. I've addressed it by sticking a Rigel QuikFinder on the tube. I also wanted to mount an optical finder on the Stowaway in addition to the Quikfinder. Locating objects is much more efficient when both are used in concert. I have since made this possible by buying a custom tube ring and mounting a dovetail shoe on it. Stowaway mounted on Orion Skyview Pro mount with Rigel QuikFinder on tube. The scope's retractable dewcap is slick in execution, but curiously stunted by design. When fully extended, it projects only a bit more than two inches in front of the lens. This is a design carryover from the f/4.8 model, in which the dewcap couldn't slide back very far without running into the tube rings, not an issue with the longer model. Roland admitted that using this design on the f/6.6 was a mistake. After using the scope for a couple of years, its fancy focuser gradually became somewhat stiff and unresponsive. I sent the focuser to Roland, who reported that the lubricant had dried out. He resolved the problem by removing the lubricant, then adding four plastic-tipped screws to the body to guide the focuser tube. Roland made me promise never to touch these screws, and I've been good about that. Now the focuser has the "feathery" feel it was supposed to have in the first place. I greatly appreciate Roland's personal attention to this issue. So much for the tube assembly, beautifully made if not quite as convenient and versatile as it might be. How does this telescope work beneath the sky? It would be difficult to overstate the perfection of this lens. Anyone who takes pleasure in admiring star images formed by the finest telescopes would not tire of this one. Stars at high power are hard round dots surrounded by one faint diffraction ring. I make no claim to being an expert star tester, but I'm unable to detect any structural difference in the Fresnel rings seen when moving a star through focus. As far as I can tell they're identical on both sides of focus. The star test reveals a trace of the colorful heritage of refractors. Inside of focus, disks of starlight show a faint violet fringe. Outside of focus, the fringe is yellow-green. When viewing stars like Vega and Sirius in focus at high power, I can barely detect the merest breath of transparent violet surrounding them, and only if I try really hard. This is the only chromatic aberration this scope will condescend to show. It will split Antares with some difficulty. Delta Cygni is easy, as is Pi Aquilae at about 1.5". Common "tests" like Epsilon Lyrae are too trivial to be worth mentioning. A more revealing test is the quadruple Nu Scorpii. The Stowaway splits the wider 2.4" pair easily, and shows the close 1.3" pair as two Airy discs in contact. I have often been amazed by the planetary performance of this little scope (and so have many others who have looked through it). It trashes my 3.5" Questar Maksutov on the planets, giving views that are brighter, sharper, and more contrasty. At various star parties, the Stowaway often gives the best planetary views available, even with much larger scopes (usually Newtonians and SCTs) nearby. This is often true even in conditions of very good seeing. Many other observers have remarked on this anomaly in tones of wonder and bafflement. The cause is frequently the mediocrity of the bigger scopes as much as the quality of my little one (and in some cases, a lack of skill on the part of the owners of the big scopes), but the results are the same. At the Grand Canyon Star Party, members of the public and other astronomers alike have assured me (without me asking!) that my view of Jupiter is better than anything else around. 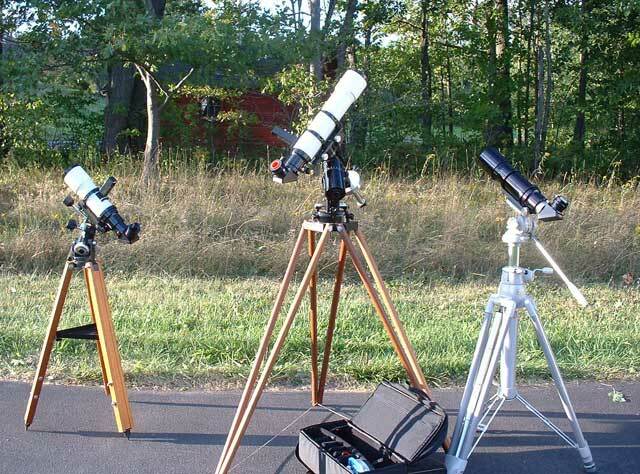 The only scopes that can be counted on to better its performance are larger refractors of very high quality. Obviously, other large scopes of various kinds are potentially capable of surpassing the Stowaway as well. All I'm saying is that in reality it doesn't happen very often. At 172X, Jupiter shows a razor sharp disk. The belts look like they were drawn with finely sharpened pencils, showing festoons, barges, white ovals, and other details. 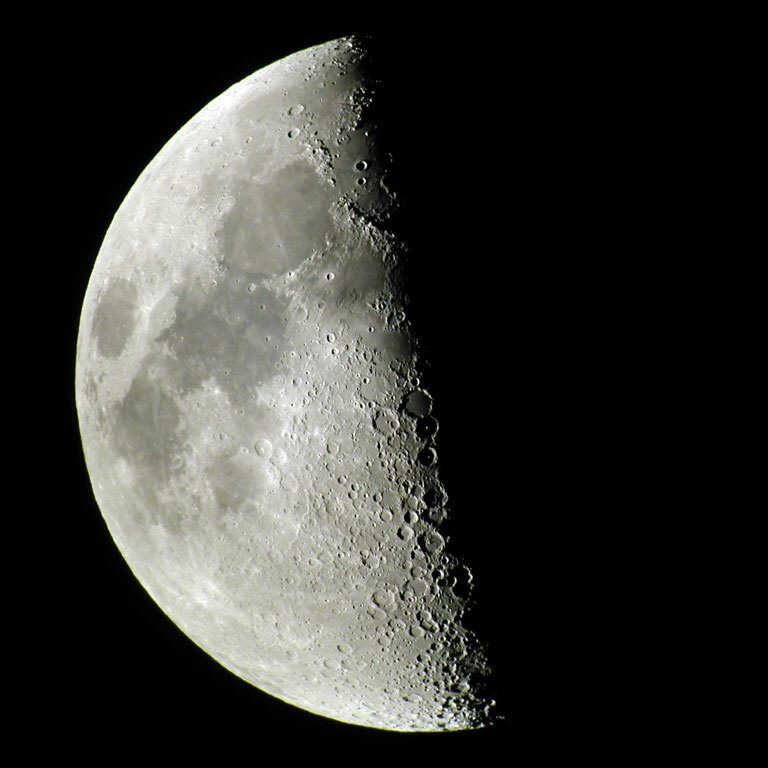 Moon shadows are hard black dots, while the varying sizes of the moons themselves can be distinguished. I've seen Europa and Io suspended as minute pearls in front of the equatorial belts. During the great Mars opposition of 2003, the Stowaway revealed considerable detail on a solid, bright, sharp-edged disk with black sky right to the edge. The larger dark areas appeared mottled, and various low-contrast features were visible in the lighter "desert" areas. Saturn of course is a flawless jewel, with the Cassini division inscribed on the rings as a fine black ellipse, and a belt or two on the disk. First quarter moon snapped through eyepiece of Stowaway with digital camera. I've been lucky enough to spend months with this scope beneath dark skies throughout the Southwest. One night in the Mojave Desert I decided to do a limiting magnitude test by drawing all the faint stars I could see around NGC 2419, the "Intergalactic Wanderer" globular in Lynx. The faintest star I glimpsed was magnitude 13.9. The Stowaway does a reasonable job of resolving major globular clusters such as M22 and M13, and will show at least a few stars in many others. Naturally it's especially adept at wide field views. Using a 35mm Panoptic eyepiece at 17x for a 3.9 degree field, the entire North America-Pelican Nebula complex is fully encompassed and beautifully seen, especially with a UHC filter. The same setup shows the entire Veil Nebula in a single field. The Milky Way resolves into a labyrinth of star clouds, meandering dark nebulae, and puffs of luminous gas. At higher powers, M33 is a bright, mottled oval. The Rosette Nebula is a huge, roughly round shape broken into large masses by dark intrusions, with a hollow black core occupied by a star cluster. The quasar 3C 273 in Virgo is easy at magnitude 12.5. With good seeing, the E star of Orion's Trapezium can often be seen, and the fainter F star glimpsed. The Orion Skyview Pro equatorial mount barely notices the presence of the seven pound Stowaway, and is extremely stable. At the often-windy Grand Canyon, it's one of the few scopes able to stand up to the wind for high-power use. The combination of a Manfrotto 3246 tripod and Desert Sky Astro altazimuth head is shakier, though still usable and very portable. In fact, with this mount packed in my duffel bag, the entire Stowaway travels readily by air, with the scope as a carryon. I've never had trouble getting it through security. The most any inspector has ever said is that it's a nice telescope. The scope also works well on that same tripod with a TeleVue Telepod head, a lighter combination. In this form, the Stowaway has accompanied me as far as New Zealand, where it revealed many wonders in the Magellanic Clouds and elsewhere. I use an Astro-Physics Maxbright dielectric diagonal to maximize the performance of this scope. Adding a Denkmeier II binoviewer with 3-position Power X Switch results in a somewhat unwieldy assembly, but it works. The low and medium power settings focus perfectly, but to use the high power setting, I have to pull the diagonal out about a quarter of an inch to get the needed focus travel. Similarly, the Stowaway will not focus a 35mm SLR camera unless a short extension is added to the focuser. I tend to shy away from using the binoviewer on the little Stowaway when viewing deep sky objects, but it's excellent on the planets, and of course spectacular on the Moon. I've been using the Stowaway increasingly for imaging in the past few years, using DSLR, Micro 4/3 cameras, and a ZWO cooled one-shot color camera. For this purpose the scope rides on either my Celestron AVX mount or my Losmandy G-11. A field flattener is necessary to prevent stars in the periphery from becoming defocused. It's the best instrument I have for wide-field imaging, and it does all right on many smaller targets as well. 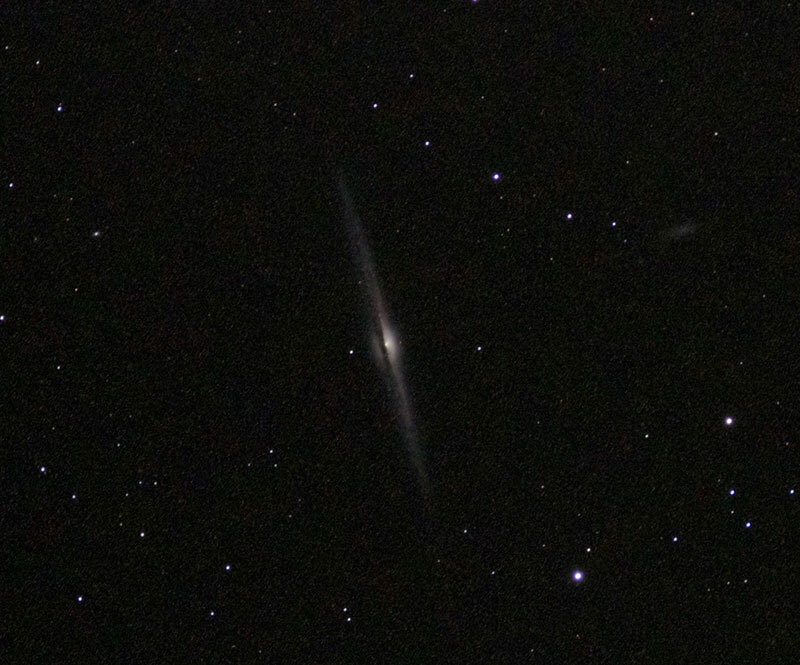 NGC 4565 imaged with Stowaway and Olympus E-PL5 Micro 4/3 camera. The Stowaway is, overall, the most refined telescope I've ever owned. The ravishing perfection of its views go far to make up for the limitations of its small aperture. If I were allowed only one telescope by some cosmic despot or hypothetical wife, I would be very tempted to choose the Stowaway. Its chief competition would be my AP 155mm refractor, but the great portability and versatility of the Stowaway would make it a serious contender. It's a wonderful, unobtrusive companion on nights beneath the stars. I consider myself very fortunate to own one. After owning and using this telescope for sixteen years, Astro-Physics surprised me and the rest of the world of acquisitive amateur astronomers by announcing it would revive the Stowaway, still at f/6.6, but now with an air-spaced design, a bigger, even fancier focuser, and a few other mechanical improvements. Roland plans to make at least 200 of these, an announcement that was like throwing a cow into a pool of piranhas. Yes, I put my name on that waiting list within hours of its coming available. Why? I reckon the new focuser and the availability of new, dedicated flatteners and compressors will make it significantly better for imaging. It remains to be seen when and if I will be able to make the switch.